We are shaded, and we are still hot. Rome is a dizzyingly constructed city, with ample alleyways and close proximity monuments, but boy-oh-boy is it hot in the summer! Currently we’re skirting a stifling 95F degree cloudless heat at pretty much all times throughout the day. The shower we both finally had at approximately 4 p.m. local time felt like a present from the pope himself. Getting to Rome was a journey in itself. In retrospect, we should’ve delayed our Roman holiday until AFTER we moved Kate into Leipzig. The flight from Berlin to Rome was delayed, which made the 6-hour wait we spent in the afternoon even more pronounced. My liquids weren’t EU-travel certified. We were running low on food-stock supplies. And we still had to travel 30 minutes into the heart of the city for our hostel, once we landed at 9:15 p.m. local time. We arrived at the gates of our hostel, jetlagged and bedraggled, with our backs achy and our hair a mess. But we slept (in an unheated room for 3 persons) well. Surfacing the next morning, after almost 10 hours of well-earned sleep, we were ready for the showers. But the showers weren’t ready for us! For some reason (drought? climate change? water conservation? ), the shower heads refused to emit any water at 9 a.m. the next morning. We were going on travel day #3 without water or soap on our heads, which is why the aforementioned 4 p.m. shower was a blessing. Seriously. After clearing my cash (thanks Chuck! 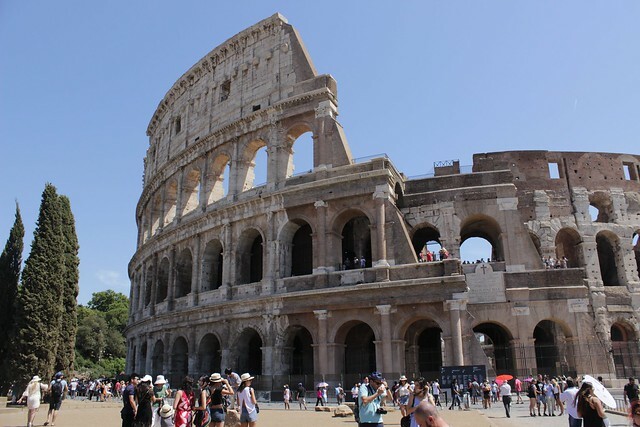 ), securing an apple and cashews for breakfast, we bought our 48-hour Roma Pass and were off to the Colosseum. Waiting for the bus ride into the city center was the longest we waited all morning. Our Roma Pass got us in the ‘tour group’ opening and into a special service line. We sidestepped a couple hundred people with that travel guide tip. 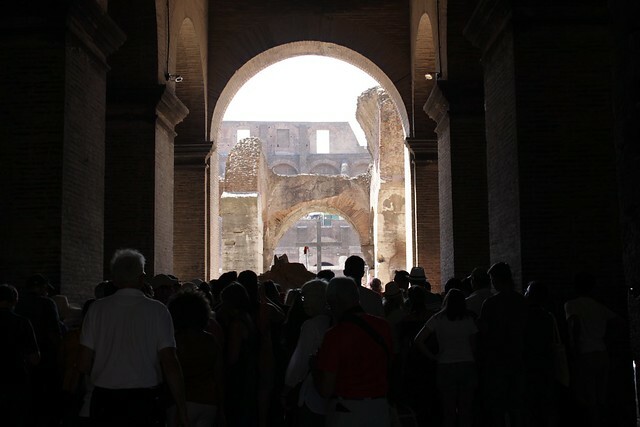 Inside the Colosseum, we circled the monument on the first and second levels, in the blinding heat of the sun. Somehow, we both thought the Colosseum would be bigger. Perhaps it was ‘colossal’ at its prime, as its name implies, but I saw building structures in Chicago that were more cubic square ft. impressive. Still for 28 Euro, the public transit service there and back, plus all the line-stepping made all the buzz worth it. For 40 Euro out of pocket? Spend that money on food. Speaking of food, we trekked up a sideways alley for a bite to eat before sweating our weight with spectators of old. An ‘all freshly made’ cafe served sandwiches, pasta, and pizza — what I’ve come to discover is typical Italian (tourist?) fare. I ordered the brushettie varie for mi madre, and it was a delightful mix of flavors. 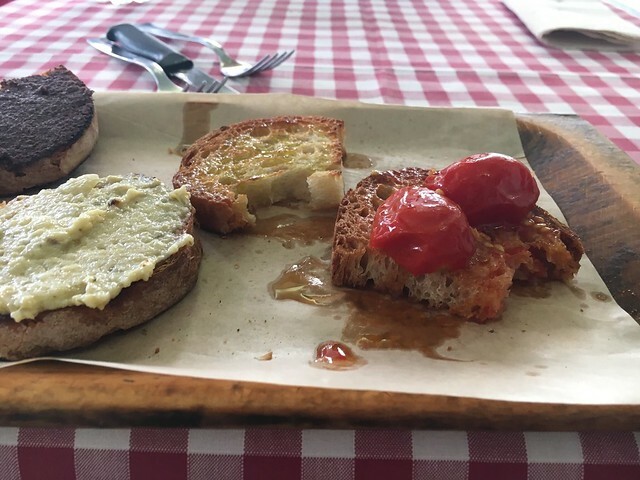 Four (extremely) toasted pieces of bread were served with four ‘varieities’ of toppings, as its name suggests. The tomatoes were so tomato-y (the freshness! the flavor!) and the olive spread was the perfect mix of taste and texture. I’m not 100% sure the flavors of the other two pieces … and I’m just going to leave it there for now. But the espresso! 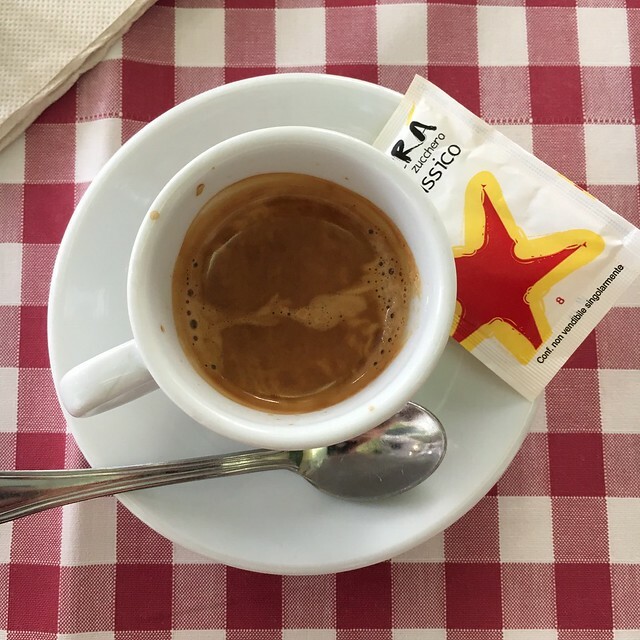 We need to talk about my life-changing experience with Italian espresso! Not going to lie, I built up the expectation of Italian coffee a little much — but as a die-hard caffeine lover in the States, I needed to be proved right. Espresso is still espresso: a tiny shot of liquid energy. But something about the lightness, the flavor, and the presentation of my first cafe espresso in Italia has been enough to keep me pounding through the jetlag today! No ‘black coffee’ on the menu — I wonder, is that standard? Do Italians (Europeans?) refuse coffee unless coated in milk or sugar? I’m glad I made the choice I did; I would not have been able to stomach a full glass of hot black coffee in this Italian heat. The blend of old buildings and even older legacy combined with the modern tour buses and the Birkenstock shoe stores and the tourists from everywhere still has me spellbound. But I do think some of the tourist traps are just that — traps for your precious, hard-earned money. The moments that make my trip are the photos, friends, and food I take with me. Paying for what everyone else pays for isn’t as fun — it just isn’t worth it all the time. And here I sat down thinking I had nothing to say so far. I still manage to surprise myself sometimes.